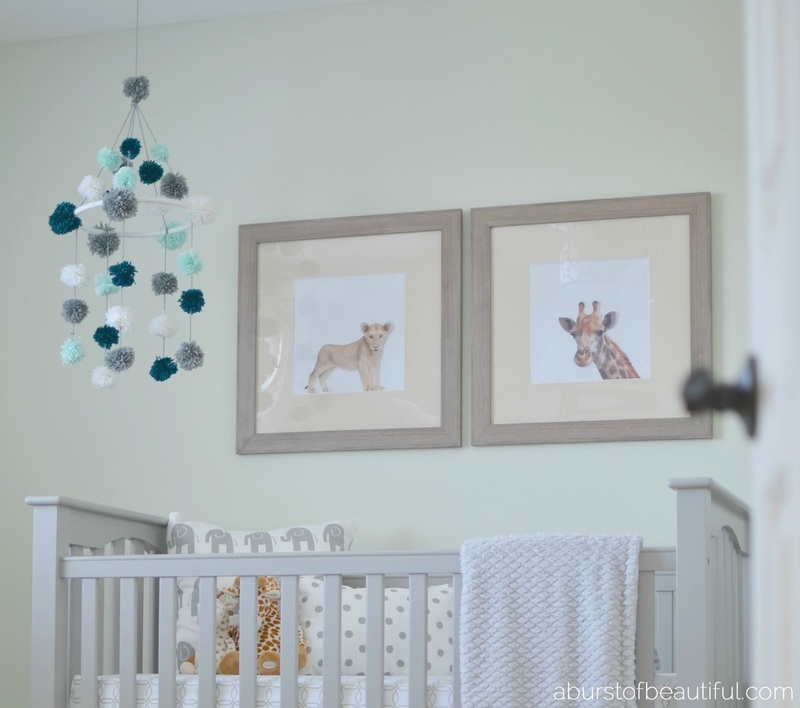 While I was planning for our baby’s arrival and decorating her nursery I fell in love with an adorable pom pom mobile from The Cross. It was exactly what I was looking for to complete our nursery. It was soft and soothing and just plain cute. 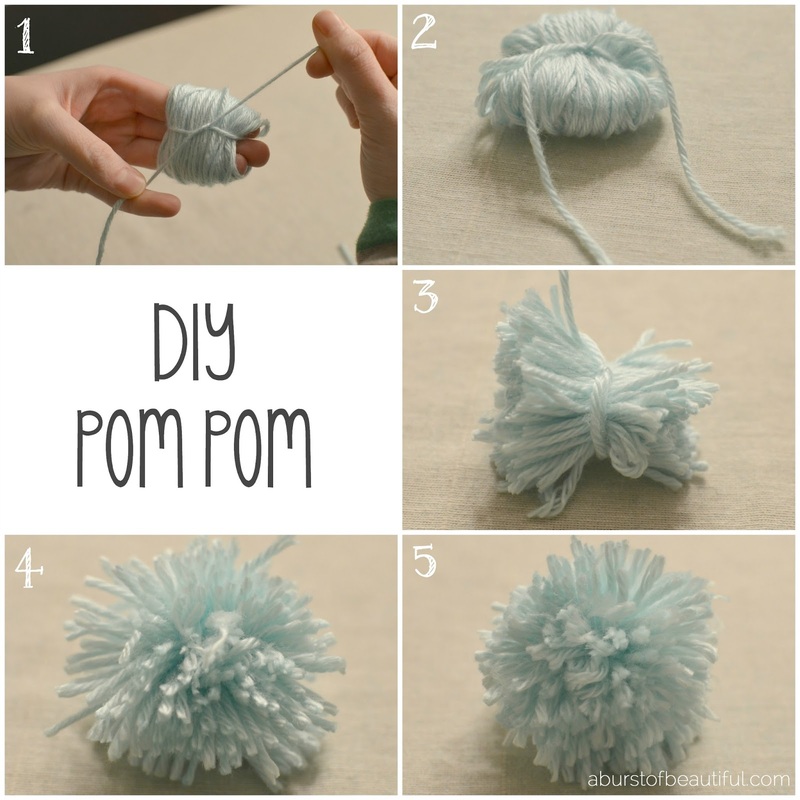 Last Christmas I saw so many great pom pom tutorials. They were everywhere…garlands, blankets and stockings. I had really wanted to try making my own DIY pom pom garland, but was just never able to find the time amidst all of the holiday craziness. 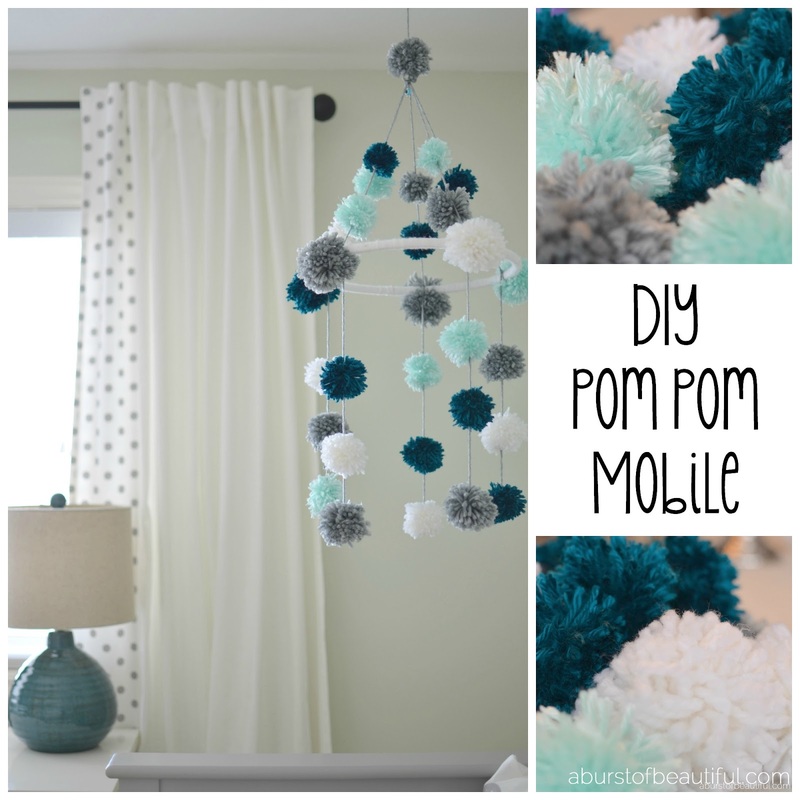 So I knew a DIY pom pom mobile was the perfect project for me now. 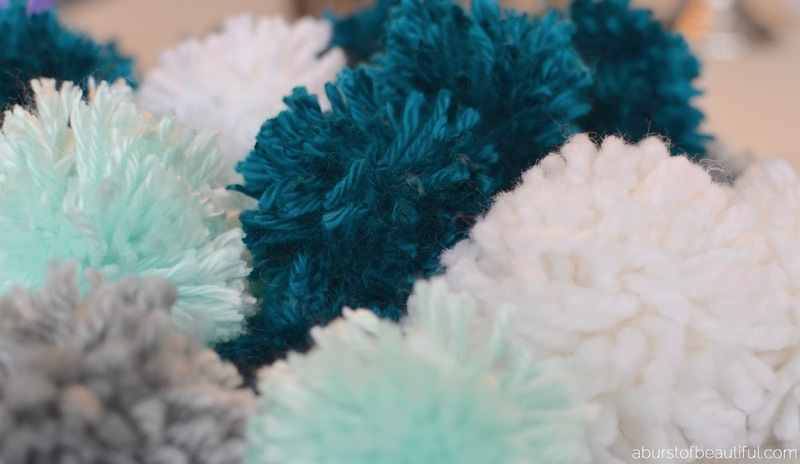 Start by making all of your pom poms. I made them in a variety of different sizes for my mobile (in total I made 35 pom poms). Wrap the yarn around your fingers (I used two fingers for a small pom pom, three fingers for a slightly larger pom pom and four fingers for the largest size). I wrapped the yarn around my fingers about 90 – 100 times. Cut another piece of yarn in the same colour (about 6 inches long). Thread the yarn between your fingers, tying once loosely. Slide the yarn off of your fingers and tighten the yarn to ensure a secure knot. Using scissors cut through the loops on both sides. 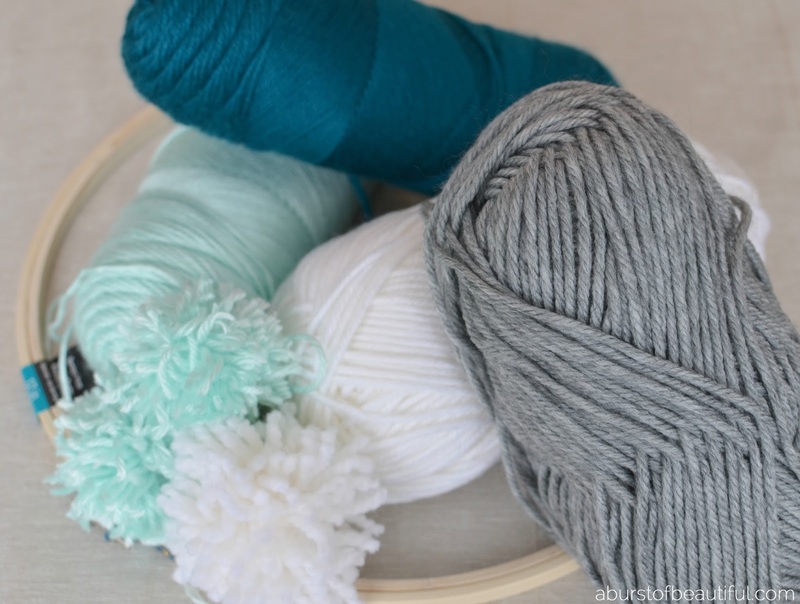 Fluff the yarn to form a full pom pom. Trim the yarn to create a uniform looking shape. 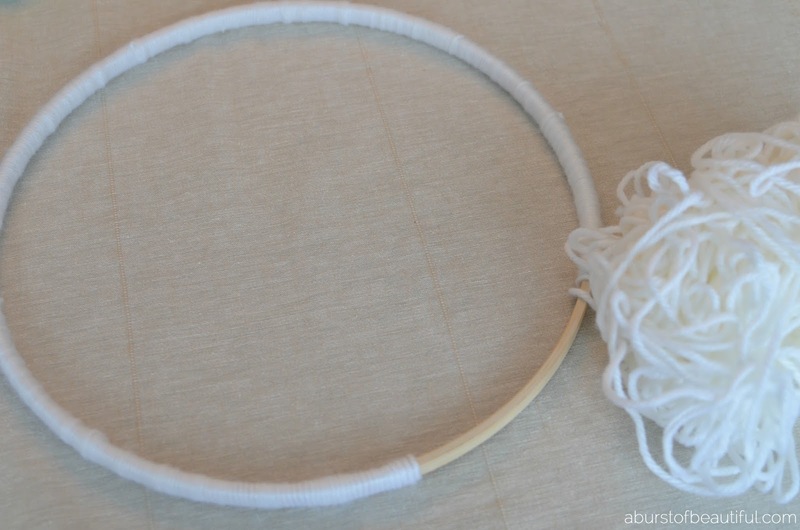 Next, take apart the embroidery hoop and use the inside hoop (without the metal piece) and wrap it in yarn. Cut five pieces of yarn to your desired length (these pieces should be long enough to gather together and tie at the very top of your mobile and hang as long as you wish at the bottom). Lay out each piece of yarn and determine the order you’d like your pom poms to be in (consider size and color). Once you are happy with the appearance of your mobile, begin tying the pom poms to the string of yarn by looping it through the piece of yarn used to tie the pom pom in Step 2. Start at the top of the mobile and work your way down. I added one pom pom at the top centre (where all five pieces of yarn meet) and two per piece of yarn before I hit the embroidery hoop. Tie each piece of yarn around the embroidery hoop and finish with a pom pom (this is where I used the largest size). Continue tying on pom poms until you reach the bottom of the yarn. We secured the mobile on the ceiling with an eye hook. Remember to keep the mobile out of reach of your baby, and ensure your mobile is secure so that no pieces are able to fall into the crib. I can't even. Seriously. This is so cute…I want to get pregnant again right.now.!!! LOL! Thanks for sharing! Haha! It's pretty cute, isn't it? I love anything with pom poms! 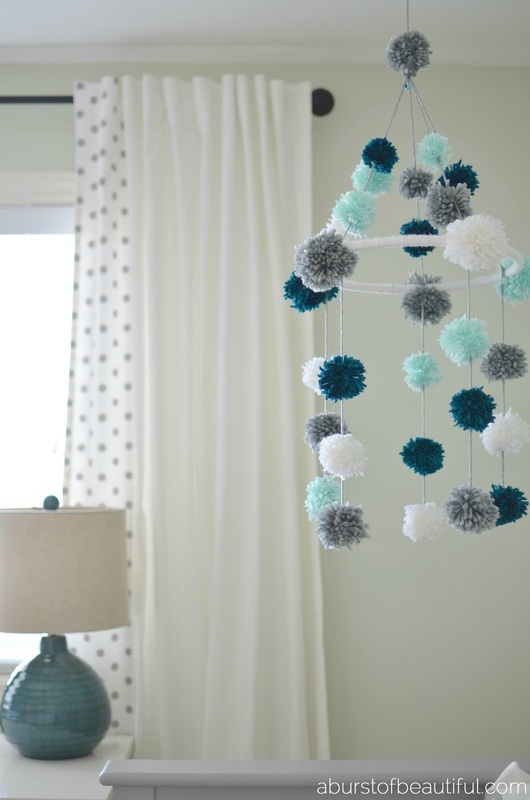 I've been making Pom poms for a couple years now but never thought of a mobile. So sweet!!! Hope you have a wonderful Wednesday!! I've been making pom-poms now for about two years. I never thought about a mobile, it is so sweet! hope you have a happy Wednesday. Thank you Stephanie! We linked up to your Friday Favorites link party, thank you for thinking of us! that is so adorable. the perfect way to bring in pops of color. This is so cute! 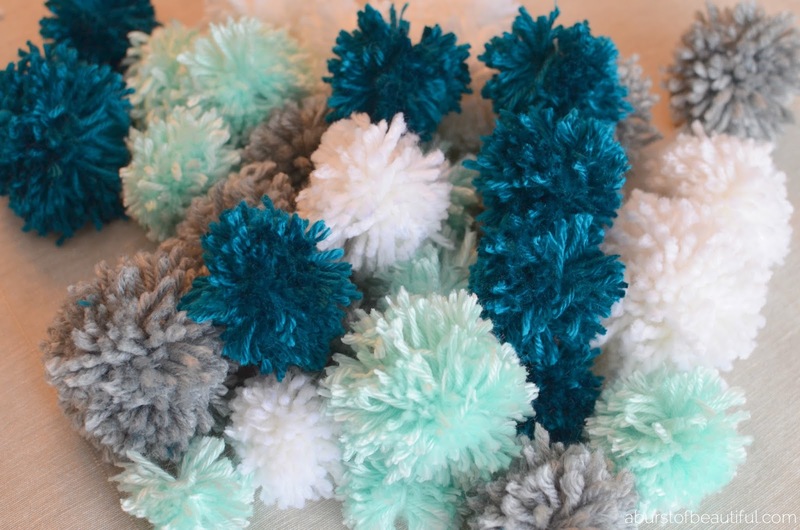 I just got back into pom pom making, I love your fresh take on them! Thanks so much for linking up! Thank you Heather! It was such a fun project to make for our little one! Thank you for sharing this at Awesome Things Tuesday last week! You've been pinned to our group board – we would love to see you again!